It’s been three years since I’ve attended ISTE (it was called NECC last time I came in D.C.), and three years since I attended an EduBloggerCon (now renamed SocialEdCon to reflect how the medium is moving beyond blogs). Fortunately, I live in California near Steve Hargadon (who does much of the organizing for these events), and I can attend activities he does here, so my life has included un-conferencing. Just as with going to CUE vs. going to ISTE, there is some perspective you get from getting not just a national, but international group together. Education reform is creeping into even the most affluent districts and even in classrooms that have been a shining example of creativity and making online connections are being given scripted reading programs, and formulaic writing curriculum. Meanwhile, in California, they tell us the scripts are dead, and you need to start thinking about creating your own curriculum. The only consistency, teachers are getting ABSOLUTELY no respect as professionals. They either can’t be trusted to teach, or are lazy and rely on textbooks too much. This is crazy and when we are forced to follow it, it makes us crazy too. There were fine moments though. In an early session on social media for teaching, we discussed how Facebook may not be the best place for sharing ideas in education (most of us prefer Twitter), it is a great place for sharing our practice in a way that is seen by our non-educators friends, families, and former classmates, and get them to understand what we do, and the frustrations we deal with. Later a discussion on writing talked about what the best hopes we had for common core, and some really great experiences some of us had with writing projects that went beyond words, and words on paper, and really embraced some of the ideas of seeing writing in a way that includes visual, and audio. Am I worried about Common Core? Am I skeptical we’ll be able to do what we need to really get beyond the bubble-test treadmill? Yes, but I also know unless we offer a positive vision of what can be, we’ve already lost the argument. Overall, a lot of the best recording is within the Twitter Stream for the hashtag #socialedcon, but there is so much traffic on that, it needs some editing in Storify. If you hear of a good one, let me know so I don’t have to do it myself, lol. 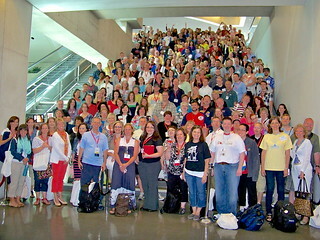 The fun and learning will continue next week with ISTE Unplugged going on during the conference. I’m continuing to add resources on my Diigo links, so a more complete list will be there.